« Who were Walthamstow Rangers? Many, many thanks to Alf Simmonds who has supplied 4 great photos from his time between the sticks at Walthamstow Avenue. Alf played for The Avenue between 1943 and 1951, with a few breaks along the way. He played in both The A’s famous games against Oldham in the 1948/49 F.A. Cup 2nd Round – the 2-2 draw at Green Pond Road (see video footage elsewhere on this site) and the 3-1 defeat in the replay at Oldham. Alf writes; “I have two different photos to those you show. They include the following players not included so far in other team photos: Freddie Tomlin, Jack Jennings, Eric Hardy (my late wife’s favourite), Reg Stather, Fred Sturgeon, Bob Stringer, Ken Crouch. 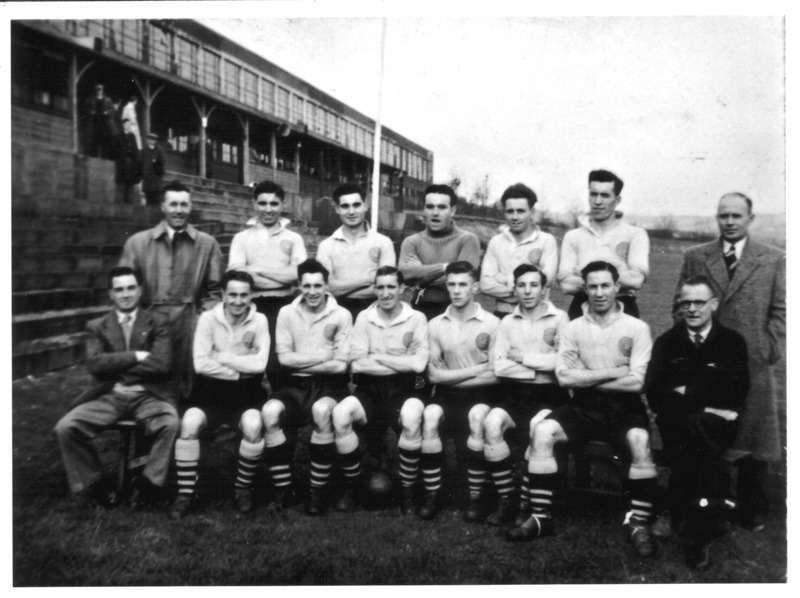 At the end of 1948-49 season we played a friendly v Hastings Utd away. I also have a photo of that occasion. It was a club “Day Out”!!!. It includes officials, players, relatives and friends. Just over fifty of us, including eighteen players. Alf met his wife of 53 years at Green Pond Road. Sadly, she passed away in 2004. Another player with a Bromley connection, albeit tenuous, was goalkeeper Alf Simmonds. 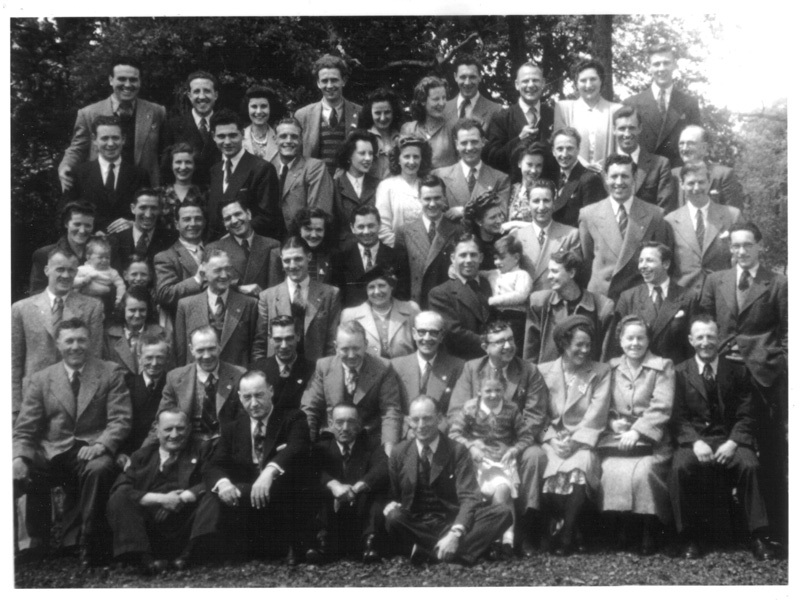 He joined Hayes from Walthamstow Avenue in March 1946 and worked in the accounts department of the Hayes News. He played for Hayes for three seasons, even turning down the chance to play for Watford in February 1948. In this time he made 80 appearances. During the summer of 1948, together with Ron Gadsden, he toured Holland with the Chelsea Mariners, a selection of amateur players from London. Later that summer he received his cap from Middlesex and played for a Hayes XI against the Indian Olympic team, before taking part in pre-season training at Great Yarmouth. He was pushing for the appointment of an experienced team manager, but when it became apparent that none would be appointed, he left and rejoined Walthamstow. Two seasons later he was playing for Bromley reserves and a season later for Redhill. 'Five Players plus Oldham Ladies and Gent'. Far Right Front: Ken Facey. In Middle: Ted Stringer. Back (left to right): Alf Simmonds, Fred Sturgeon, Fred Tomlin. 1948/49 Post-Season Friendly at Hastings United. Sitting: 4 Members. First Row: Jim Lewis (Snr), Curly (groundsman). Second Row: 1. Ted Harper. 4. Arthur Kingham. 6&7. Bert Pinner & Wife. Fred Tomlin. Third Row: 1. Mrs Waller & baby. Frank Butterworth & son. Bill Banham. Fred Lamprell & Wife & Scott (? ), Jim Jeffrey & girlfriend, Reserve Goalkeeper Eric Hardy. Fourth Row: Alf's Best Man, Sam. Mrs. Sturgeon & Fred. 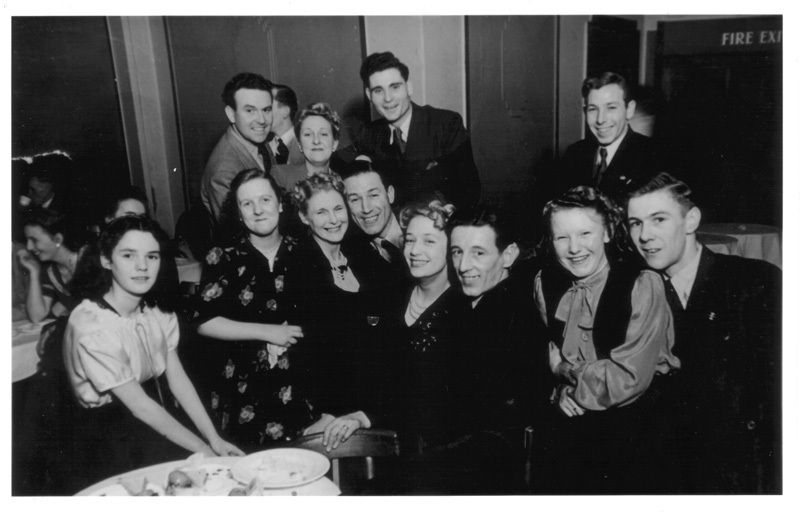 Bob Waller, Mrs. Facey, Mrs. Fuller, Freddie Fuller, Mrs. Stather, Reg Stather, Ken Smith (?). Back Row: Alf Simmonds, Ken Drage & wife. Derek Saunders & wife. Mrs lewis & Jim Lewis Jnr, Fred Bosher & wife. Ken Facey. 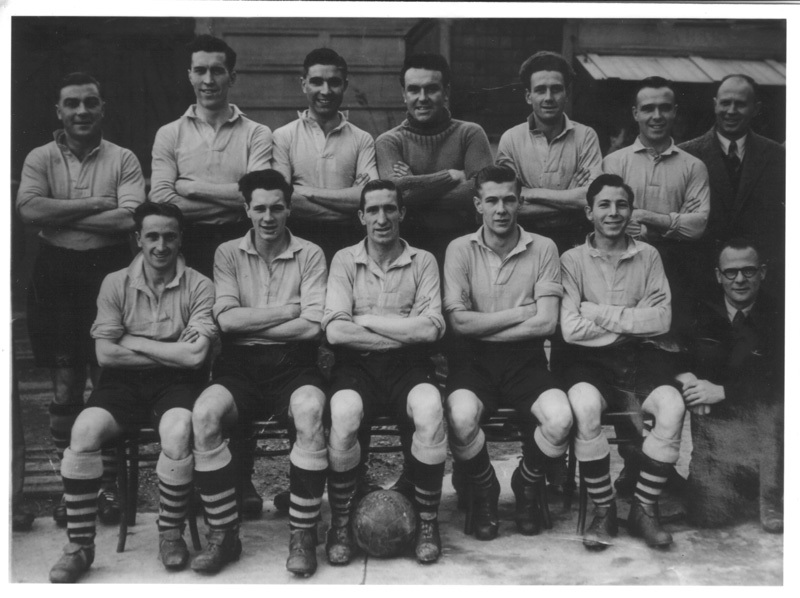 This entry was posted on May 30, 2010 at 8:32 pm and is filed under 1940s, 1950s, Team Photos. You can follow any responses to this entry through the RSS 2.0 feed. You can leave a response, or trackback from your own site. Thank you very much for locating some photos of my late father Freddie Tomlin. He passed away in August 2001 but to the end he often used to talk about the happy days, the players and the club that was Walthamstow Avenue. He was proud to have represented such a distinguished club. Does anyone remember my father, Arthur Emlyn Thomas? He had some role with Walthamstow Avenue, i.e., trainer, manager, I’m sure. He told me that he (and others I presume) turned down Bobby Moore as a player. I was born in 1948 so it would have been around that time I guess. He died a long time ago and there is no-one else in the family to ask. I have just discovered the photo of the Avenue on their visit to Hastings. I would like to correct a name on the caption, (Ted Harper), is in fact Sidney Harper, my father, who passed away in December 1970. He was a long-time member of the Walthamstow Avenue Club, mainly with the 2nd team. I myself spent many hours watching both the 1st and 2nd teams over many years It is vividly recorded on my mind, that during one close season, weeding the goalmouth of many and various weeds, under the supervision of Curly the groundsman! I am enjoying the site immensly.